I the train journey from Lhasa to Beijing took two days. The train traveled across all of China, from the Tibetan Plateau to the mountains of northern China, past the terracotta warriors in Xi’an and onwards to Beijing. The Beijing municipality is roughly the size of Belgium, so it took a while to get to the center of town. I was awed by Beijing’s size, impressed by its modernity, and disgusted by its polluted air. I fell sick with a swine-flu-like illness within a few days. I blame the air. Though I had enjoyed discussing politics with the Chinese on my train, I still couldn’t see eye to eye with government. As I walked through Beijing, I allowed my political beliefs to overshadow Beijing’s cultural gems. When I saw the Forbidden City, I cynically remarked that it was only spared from the Cultural Revolution because Mao wanted to use it for his own purposes. When I stood in Tiananmen Square, the largest in the world, my appreciation was dulled by the memories of how the government squashed the 1989 pro-democracy riots. Then I went to see Mao’s embalmed corpse, which is displayed in Tienanmen Square like Ho Chi Minh’s in Hanoi and Lenin’s in Moscow’s Red Square. I was a bit disappointed by Mao; Uncle Ho’s mausoleum outdid Mao’s in almost every way – a better building, better atmosphere, better guards, and a better looking corpse. I still have one more embalmed communist dictator to see in Moscow, so I will reserve my final judgment until after I see Lenin…but so far Uncle Ho is in the lead. But my journey was almost over, and I needed time to think. I needed a walkabout. 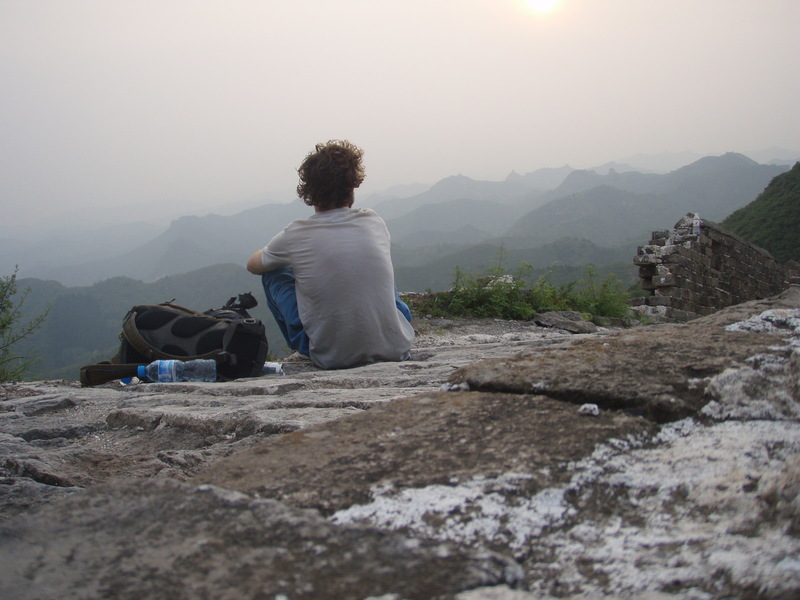 I hiked onto the Great Wall at sunset and spent a night in one of its watchtowers. I thought about my journey and I tried to put everything into perspective. As I stared out over the hills towards Mongolia, a white ghost appeared high above the Great Wall. What was this apparition? The ghost of King Hamlet? And with that, my relationship with the gods of Ancient Greece came to an abrupt end. I awoke the next morning and watched the sun rise over the Great Wall. I was on my own with no more help from the Greek gods. I headed back to Beijing, organized my affairs and prepared to leave Beijing, to leave China, to leave Asia behind.